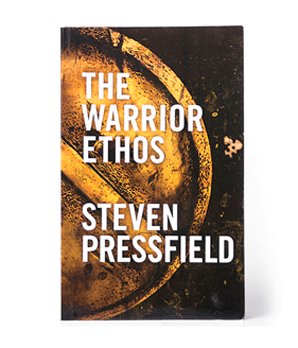 The Warrior Ethos started as an experiment that I and my publishing partner, Shawn Coyne, initiated in 2012. We printed 18,000 copies and gave them all away to U.S. troops (primarily Marines and Special Forces) in Iraq, Afghanistan, and the States. It was quite a logistical challenge, and we got a lot of help from friends on active duty. We were doing things like boxing up 500 books and sending them to a single battalion. The Warrior Ethos was mini-sized—4 3/4” x 7”—so it could fit in a trooper’s cargo pocket. Why did we want to give these books away? Mainly because I knew, from emails and letters from soldiers who had read my other books like Gates of Fire, that many of our guys and gals serving in harm’s way were dealing with a particularly pernicious form of emotional stress. The “gray areas” of the kinds of wars American servicemen and women were fighting had left many of them feeling like they’d lost touch with the ideals that had impelled them to sign up to serve in the first place. The Warrior Ethos was my way of trying to help them reconnect.